CuraDebt Tax Services is an accredited, Florida-based tax debt relief company that assist customers nationwide with tax debt. CuraDebt is a long-running company that has been assisting consumers nationwide with various financial needs. Although they were officially founded in 2000, their team has helped businesses and individuals since 1996. CuraDebt can help you resolve your tax issues -- even if it is not listed above. They use a three-step process to solve your specific tax problem. First, they do an investigation of your situation. CuraDebt’s tax professional may request an immediate stay of enforcement with the IRS or State. They will then perform a financial analysis to identify current and projected financials under the IRS and State standards and review the master tax file, tax transcripts, penalty abatement qualifications, statute of limitations on the collection of tax debts, and possible resolutions for your situation. The second step is to make sure any missing tax returns and filed or that any returns with mistakes are amended. This ensures compliance with the IRS regulations to keep you in good standing. The final step is the resolve the situation (that was recommended during the investigation phase) with the IRS or State. 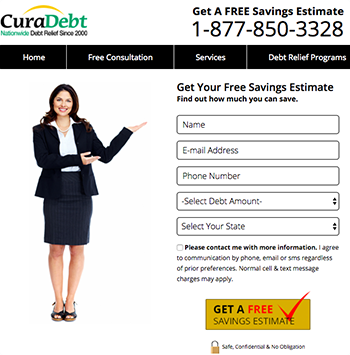 To learn more about CuraDebt and their services, you can contact them for a free initial consultation. Accredited service: CuraDebt holds several memberships, including one with the ASTPS (American Society of Tax Problem Solvers), the NATP (National Association of Tax Professionals), and the NATRC (National Association of Tax Resolution Companies). Accredited staff: CuraDebt has licensed and certified staff, including CPAs, tax attorneys, and enrolled agents. Many of these agents are former IRS employees, revenue officers, and special agents with over 83 years of experience working at the IRS or State taxing authorities. Free consultation: Potential clients can undergo a free, no obligation consultation with a certified tax representative to determine their pricing and best options for moving forward with their unique case. No upfront fees: CuraDebt doesn’t charge any upfront fees on work that hasn’t been performed. However, they do charge an installment fee if you choose an installment plan (this fee is only charged for the months where you make a payment). In-house program: CuraDebt has an in-house program, which takes out any need for third-party companies and saves their clients a good deal of money in the long run. However, if they don’t have the right solution for you, they can refer you to another credible company that can handle your case. Educational blog: CuraDebt’s website has a blog with informative articles on various financial topics. However, it is not regularly updated and focuses more on credit cards and less on tax relief. Refund policy: CuraDebt has a refund policy, although it is difficult to find details regarding it on their website. Although they hold many other memberships and accreditations, CuraDebt is not BBB accredited. CuraDebt’s website lacks some transparency on their pricing, refund policy, and who they partner with on tax relief cases they can’t solve. They are not a member of the NAEA (National Association of Enrolled Agents). States not eligible for CuraDebt’s tax relief services include Colorado, Connecticut, Georgia, Illinois, Kansas, North Dakota, South Carolina, Vermont, Washington, and West Virginia. Curadebt’s pricing depends greatly on your unique situation. Their exact pricing after the tax work is completed is not listed on their website. They accept a minimum tax debt amount of $5,000. CuraDebt works with flat-free pricing. If you have less than $25,000 in tax debt, your initial investigation costs $950. This cost increases with higher tax debt amounts. CuraDebt clients must pay a $49/month installment fee if the select the installment plan. These fees are only charged when you pay the monthly installment (not for the months you don’t pay an installment). This also means that the faster you pay off your tax debt, the less you have to pay overall. If you choose an installment plan, your initial payment must be at least a quarter of the total. You can pay up to 10 installment periods. Aside from the installment fees, CuraDebt states there are no upfront fees before any work is completed. Yes, but it can be much more challenging to pursue it on your own. Tax relief services like CuraDebt Tax Services have knowledgeable and licensed agents who have years of training and education.